What parent hasn’t been there at one time or another? You could be standing in the aisle of the grocery store, waiting at the DMV, or even just at home getting ready for bed, and there’s your child… on the floor… and they’re screaming. Maybe you’re embarrassed by the stares and the under-the-breath mutterings of strangers. Or perhaps you’re just exasperated by the one-way arguments that often lack any type of logic. No matter how you feel when it happens, one thing is for certain: temper tantrums can and do happen to the best behaved of children; and it doesn’t mean that you’re failing as a parent. Somewhere around the age of 2 most children go through a phase where their inability to effectively communicate their feelings and their awareness of having no autonomy combine to create a perfect emotional storm. These outbursts can come in different forms and with any number of acts to the performance. Crying, screaming, hitting, and throwing things are all reasonable options to a toddler that’s having a meltdown. This is often one of the hardest things to do because temper tantrums can be as frustrating for parents as their children. It’s important to remember that your child isn’t angry at you, regardless of what they say or do in the heat of the moment. They are simply learning the limits of what they can and can’t do, or have and not have. Your children look up to you and they learn how to deal with various situations from watching how you handle them. Yelling and shouting, however much you may want to, will only reinforce the idea that it’s the appropriate way to handle situations like that. Instead, remain calm and keep your voice low and even. Without negative energy to feed from, your toddler will settle down faster. As long as your child is not actively hurting themselves or destroying things, and as long as you’re not in a public place, one of the best things you can do is to ignore the tantrum. Sometimes over-the-top outbursts are cries for attention and if you don’t entertain it, your child may eventually stop. The more you engage with your child while they are throwing a fit the more they will associate their behavior with attention. By simply walking away, you are showing your toddler that continuing their outburst won’t get them the result they’re looking for. Be prepared however for your child to escalate things briefly in a last-ditch effort to win. One of the most futile things that a parent can do is argue or try to reason with a child that is screaming and crying uncontrollably. It’s usually best to wait until after the tantrum passes and your child can communicate better before trying to talk to them. If possible, take him or her away from where their temper tantrum started and bring them to a private place. A change in scenery may help them balance out their emotions. Taking them into a restroom or even outside of the store for a few minutes will allow them to compose themselves. Sometimes children continue their tantrums because they’re drawing attention from people and they don’t want it. Once they’re in a private spot and settled down, you can talk with them about their behavior in a calm manner. As a parent of a toddler you have to know how to pick your battles. Sometimes things just have to get accomplished; you have to leave the house on time or you need to get out of the grocery store. It’s times like these that you’ll need to decide which is the lesser of evils. While constantly giving in can certainly set a precedence for future behavior, there are times when meeting in the middle is an acceptable alternative. If your toddler wants some candy at the store but you don’t want them to ruin their appetite, you can offer to buy one on the condition that the two of you split it. By slightly altering the reward your child is not necessarily getting their way, but you’ll still be able to move on faster. Its important to remember that young children don’t always understand what they want or why they even want it. By still giving them something, they may feel that they’ve won enough to move on. This is one of those times when it’s a good thing that children have short attention spans. Does your child want to go swimming but it’s currently 50 degrees outside? I’ve been there. Show them the sandbox that’s been neglected for the last few weeks and they may forget all about wanting to swim. Often times you can get your toddler just as excited about something that they can have as whatever they are throwing a fit over. Often times when a child has a temper tantrum, it’s really about their inability to articulate their feelings. Children need to be taught how to properly assign words to their emotions as part of the developmental process. Listen to what your child is trying to communicate instead of just seeing them as being unreasonable or spoiled. Most of the time what your child is trying to say that they are tired, hungry, or just want some of your attention. When both of my boys were babies we worked with them on sign language. Before either of them could speak they knew the signs for things such as “food”, “juice”, “potty” and other day-to-day phrases that young children get frustrated over not being able to communicate. By helping them learn how to properly express themselves you may just avoid some future outburst down the road. A little bit of levity can go a long way in getting your child to change their mind. Even adults often use humor to break the tension of certain situations. Silly faces or funny voices can get your toddler’s attention off of what they were obsessing over just seconds ago. Since your anger can often cause a child’s tantrum to escalate, making light of the situation will also let them know that you’re not mad at them, something that can add to their outbursts. The other benefit of using humor is that it can calm your temper down as well. That way you won’t make threats or say something that you really don’t mean out of frustration. Sometimes there is just nothing that can be done to stop a toddler’s tantrum. Either what they want is impossible to give, improbable to do, or you just have to stick to your guns. When this happens, it’s important to still maintain a position of authority. Much like compromising, find some small way to calm your child down while not totally giving in to them. If you’re shopping and your child wants to leave and begins to throw a fit, by telling them that you will leave in “just 5 more minutes” may settle them down while still keeping your position of authority. It’s important to remember that testing boundaries is part of a toddler’s growth and development and as badly as you may want to move past the incident, you also want to help them learn to control their emotions. I learned a lesson early on in parenthood; do what you say you’re going to do. Often times it sounds a lot simpler than it is. This lesson has taught me to choose my threats very carefully. If I tell my son that if he does something that he’s not supposed to then he will be punished, then I have to be ready to follow through on it. Be sure to only give ultimatums that you’re ready to follow through with. If you tell your child that if they don’t calm down then you’ll leave the playground, be ready to actually leave. If you don’t follow through with a threat, then you’ll reinforce to your child that they are in control and next time they may hold out a little bit longer. You may find that even on those occasions where you do give in to your child’s tantrums that it does no good. That’s because these episodes are often confusing and scary for the them and they can’t comprehend their own feelings and actions. One thing to try is getting down to their level and simply comforting them until they can calm down. Most children feel bad when they act out because they know that their behavior is disappointing their parents, but they can’t stop. When this happens, they may be seeking some form of comfort and reassurance from you. Calmly communicate to them that while their behavior is less than ideal, you understand it and still love them. Once you can get your child to calm down you can talk to them about why what they did was wrong and how to avoid doing it in the future. The next time your child is having a temper tantrum, simply take a deep breath and relax. You’re ultimately in control of the situation, even though at times you may feel helpless. Try to communicate and to understand the situation before acting. Despite your best efforts you may still not be able to stop a meltdown, and in most cases, that’s okay. 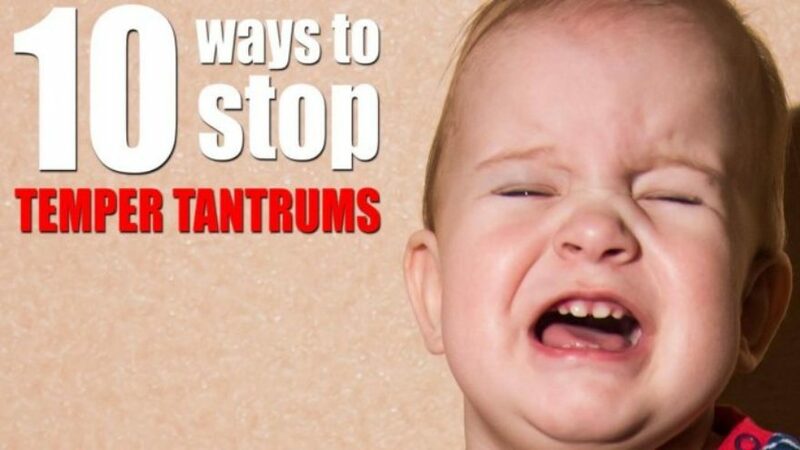 Tantrums are opportunities for parents and toddlers to both develop skills on communicating with each other. As long as you follow some simple (and not so simple) guidelines, your child will eventually outgrow the need of having temper tantrums.